"What we found was a gene mutation that results in a missing protein necessary for cells to be pigmented," said Winkler. "Some defects in this same gene cause a condition called oculocutaneous albinism in humans." 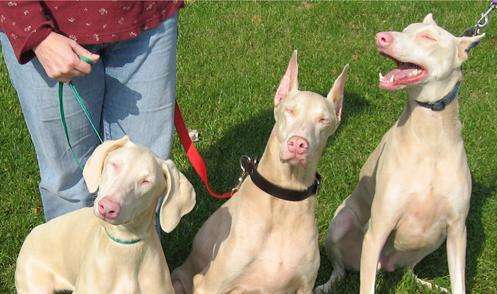 "With an albino Doberman, you see a white or lighter-colored coat, pink noses and lips, along with pale irises in the eyes," said Winkler. "These traits are very similar to the characteristics humans display with this particular condition causing light-pigmented skin and hair, along with eye discoloration and vision disturbances." "We knew that the albino Dobermans typically developed these types of tumors, much like humans, but we wondered what the actual increase in prevalence was between a 'white' dog and a regular-colored Doberman," said Bartoe. "What we found was a significant increase in risk for development of melanoma-like tumors in the albino dogs." The results of their research could be of great importance to Doberman breeders around the world. Currently, American Kennel Club registration restricts dogs with the condition. "Because Dobermans can carry the defective gene, but show no signs of the disorder, this has posed serious problems among breeders," said Bartoe. "But now that we've identified the mutation, we can look at the genetic makeup of these dogs and determine if they might be carriers." Guess now we know that in cave society the dog was REALLY man's best friend.